There is a proof question going around the Asian interwebs lately taken from the Asian/Singapore Math Olympiad (SAMSO) and has gained notoriety for baffling everyone that isn't a Kurt Godel! (I kid! Because this question is for 14 year-olds). I did some simple courses in discrete mathematics for personal interest but it has been awhile and certainly is not my cup of tea anymore so I would like to see fellow TL'ers solve this. Over the years I have seen a few math wiz members here so don't be shy, I know who you are! Remember, Albert is told either May, June, July or August. Albert: I don’t know when Cheryl’s birthday is, but I know that Bernard doesn’t know too. All Albert knows is the month, and every month has more than one possible date, so of course he doesn’t know when her birthday is. The first part of the sentence is redundant. For Albert to know that Bernard does not know, Albert must therefore have been told July or August, since this rules out Bernard being told 18 or 19. 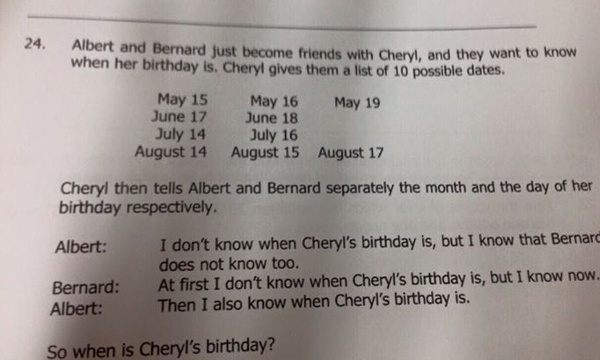 Line 2) Bernard: At first I don’t know when Cheryl’s birthday is, but now I know. Bernard has deduced that Albert has either August or July. If he knows the full date, he must have been told 15, 16 or 17, since if he had been told 14 he would be none the wiser about whether the month was August or July. Each of 15, 16 and 17 only refers to one specific month, but 14 could be either month. Line 3) Albert: Then I also know when Cheryl’s birthday is. Albert has therefore deduced that the possible dates are July 16, Aug 15 and Aug 17. For him to now know, he must have been told July. Since if he had been told August, he would not know which date for certain is the birthday. This was a fun thinking problem to spend a few minutes on. We have absolutely no idea which month Albert has been given. Albert knows the month. He knows that Bernard doesn't know the whole date either. It cannot be on a month with a single date, because otherwise Bernard might know it. So it's not May or June. At this point, Bernard knows the day, and the month as well based on the remaining options. This means that July 14/August 14 are not an option. August 15, July 16, August 17.
as there would be two viable options for him to pick from still. Neat logic problem . I wouldn't consider it a math problem though. Of course as always we have to assume Albert and Bernard are perfect logicians. I got it via e-mail from some relative. it's not very hard, but i needed to write stuff down to get an overview of the facts. I don't think i was able to solve it when i was that age though. In spoilers my reasoning in Dutch, because i'm too lazy too translate. It's nearly equivalent to the given answer. Volgens de eerste tip weet je dat de dag niets zegt, als je weet welke maand het is. Dit betekent dat maanden waarin een unieke dag zit, afvallen. Kijkend naar het schema hieronder, betekent dat dat mei en juni afvallen. Immers, de 19e en de 18e komen in geen andere maand voor. Augustus bijvoorbeeld valt niet af, omdat 14 (juli), 15 (mei) en 17 (juni) in andere maanden staan. Als de verjaardag in Augustus was, was de eerste tip niet waar geweest (en daar gaan we even van uit). Dus nu hebben we nog 2 maanden over: juli en augustus. Omdat Bernard dit ook kan redeneren, weet hij dat de maand juli of augustus is. Hij zegt nu de verjaardag te weten. Dit impliceert dat de dag van de verjaardag niet 14 is. Immers, als de dag 14 was, wist bernard de verjaardag nog niet; het kon 14 juli óf augustus zijn. Dus er blijven nog 3 data over: 16 juli, 15 augustus, en 17 augustus. Omdat Albert ook tot deze uitkomst is gekomen, weet hij de verjaardag. Dit betekent dat hij de verjaardag weet, ondanks dat hij niet weet welke dag de verjaardag is. Zou de verjaardag in augustus zijn, is dit onzin. Immers, de mogelijkheden zouden dan 15 en 17 augustus zijn. Dus de maand is juli. Omdat we weten dat 14 juli afvalt, moet de verjaardag dus op 16 juli vallen. I'm a bit proud of myself for doing it without writing anything down, but realistically I probably shouldn't be. I got it right the first time without writing anything but I can't remember if that was actual logic or just luck. pretty cool once you know how to do it, a bit tricky though remembering to constantly refer to both the sentences and the original items both knew. when I did it the second time I got to the 2 left months and got slightly stuck since I forgot about the previous lines and the fact you still had to consider them. very tricky to figure out in your head though. July 16. Ez Pz Lemon Squeezy.